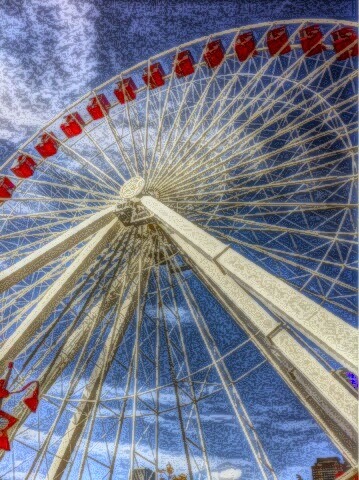 Public domain picture of a Ferris wheel. Public domain pictures are free to use any way you want. You can modify these pictures. You can change the colors, you can add decorative elements, you can cut some parts off, and you can add text into it. You can use it in your blog or blogs, no matter how many times you want to. You can even use public domain pictures commercially. You may even print these images out. No offense meant. You should not use photos that show an identifiable person or persons especially when the images create a negative image of the person. However, if you really feel that you have to, you can ask for that person’s permission. Otherwise, you can blur features out so they will not be easily identifiable. Objection, misleading. Never use possibly misleading images and misleading images positioning. For example, you are not supposed to post an image of World Health Organization next to a health supplement. It will send a misleading message that it is approved or recommended by WHO. Even though you did not directly state that, it might mislead people and you should avoid doing that by all means. Find Release. Even though there isn’t anything offensive in an image, as long as there is an identifiable person in the public domain photo, then you should first ask the permission of that person or the “model” before you use the image. This is more of an act of courtesy which is called “model release”. Always try to put yourself in the person or the model’s position when using public domain pictures. This is so they will not be surprised to be a part of your blog, your campaign, or even your product. The principles of model release also apply to private properties. In this situation, it is called “property release”. Property release is needed for private homes, for building designs, for gadget designs, for private vehicles, and more. Remember, the model release and the property release is only needed for commercial use. If you will just use public domain pictures with identifiable persons or private properties in them, that is classified as editorial use. · Cards on the Table. Rogers VS Koons is a popular image copyright infringement case. The photo was meant for use in greeting cards when Jeff Koons used it defending that it is used as parody. Rogers won as Koons could have used other public domain pictures instead. · Obama Care. Shephard Fairey modified a photo of US President Barrack Obama and this poster was approved by the president’s campaign. Mannie Garcia, the original photo’s owner sued Fairey and the case ended in a private settlement to equally divide the profits for the image.